Here’s a Romantic Vintage Image showing a Lady with a Flower Basket! The basket is full of pretty Pink Roses and the woman is wearing a lovely flowing dress. Nice for your Shabby Projects! 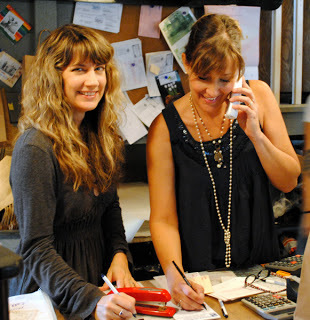 In Other News: The Lucketts Store Holiday Open House is this weekend! Nov 2 – 4th 2012. If you live in the greater D.C. area be sure and stop by, it is gorgeous and worth the trip! I’ll be working one of the counters, along with my friend Lisa, and the rest of the crazy bunch, be sure and say hello if you stop in! Also Marian will be doing a Book signing for her new book! Victorian Fashion Ladies Image! 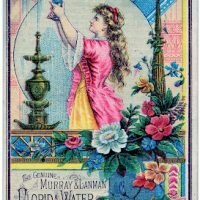 Antique Advertising Image – Pretty Lady with Fountain Vintage Typing Ladies Image! Thanks Adi! And yes, she is and super sweet too! Thanks Cynthia, I’m glad you like the lady! Love the slightly whimsical look to this lady. Thanks Karen. Thank you for your comment Shirley, and for sharing about the work you are doing!! I’m so happy that you are able to use my graphics for such a wonderful cause! Blessings to you. Hei Karen,danke für die wunderschönen Bilder.Bin immer begeistert.Schönes W.E.Bussi.Luciene. I didn’t even think that you might be working behind the counter! We came by on the 2nd and made a purchase outside the design house and inside the store.